Hi Stamp Annie Thing fans and happy Monday! It's Stacey from Stacey's Creative Corner with you today. 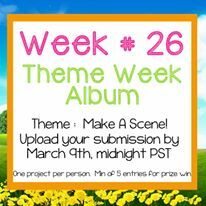 Today kicks off the start of a new Theme Week Challenge. This challenge is all about making a scene!! I decided to make a fun outdoor scene for my card. I created an A2 card base from some white cardstock and layered it with some fun floral paper. I then cut out some light blue cardstock and added some grass as well as a sun peeking through some clouds. I stamped my greeting and then added that adorable stamp, Sofia - Burst Your Bubble. I paper pieced her dress to match the card and colored the rest of her with my Copics. I popped her up with some foam tape and added a few random bubble and some flowers to finish my scene. --A stamp of your choice will be awarded to one lucky winner, if we have 5 or more entries. I hope you will join us in the theme week challenge! Thanks so much for stopping by! I hope you have a great crafty day!